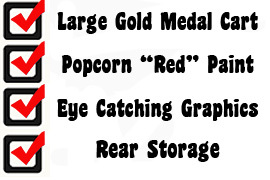 Gold Medal's 2003 Whiz Bang popcorn machine is "The" sales maker. This could be the fastest and most economical popper offered. Customers wont be able to resist the lit popcorn light and fabulous smell of fresh popped popcorn. 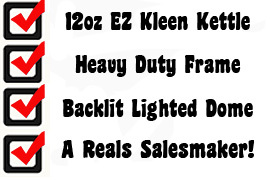 The 12/14oz EZ Kleen kettle will pop up to 250-1oz servings per hour. This will help keep up with the wildest of crowds. 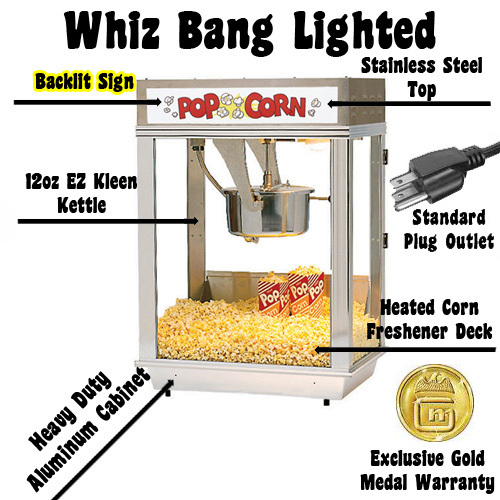 The heavy duty aluminum cabinet, heated corn freshener deck, and twin rocker arms, make the Whiz Bang 2003 a super great popcorn choice. Why wait? order yours today! This "Sales maker" features a Unimaxx kettle mounted in the extra strong cast aluminum twin hanger arms. Producing 250oz per hour. Removable kettle for easy cleaning. The "top of the line" 12/14oz kettle popper.